RK asks about Madhu after shootout n Bittu says alls well..! RK calls Madhu n rushes out ! Paddo pats Aryan to sleep n Sultan comes.. says they are leaving! Sultan says how at age 8 he had seen goons come at his home n forcefully took him .. n his mom was shot dead when she tried to save Sultan! He says how he found his mom dead at the door ..trying to see Sultan one last time! He says how he had no money to even do her last rights ..so he had to steal ..! Says how he worked at tea vendor … returned stolen money .. killed the guy who killed his mom .. He says.. he isnt trying to justify nor gain sympathy … he chose this world..coz worlds ways din fit him ..n neither did he fit! He says.. strength that can be used on others.. helps one to stay alive.. he apologises for whatever happened! Paddo asks Sultan to let Aryan come to live his childhood here! Sultan leaves..! Madhu arrives! She feels someone holding her shoulder n turns n says Sultan u. .n RK says..before Sultan.. her films hero… Introducing Mr. Rishabh Kundra! Madhu says.. neither can she forget what he has done to her n neither will he let her..! RK tells her.. no one shows their back to God in temple n to RK outside temple! Madhu asks why is he here? He asks how she is n she says.. have seen worse n survived.. u dun bother..! RK turns her around again..asks where is ur friend? Madhu asks..why to tell? RK says.. ‘Sawal ke badle jawab..not sawal’ Madhu asks why he wanna know? RK says coz cant see Madhu with anyone else.. Madhu asks why not?? ANSWER!! RK refuses to answer! She asks.. him why he doesnt let her move on? doesnt let her be happy? Madhu holding RKs collar n shaking..
Shaye meri.. Math ho teri..
Fir kyun har pal ..bechaini hai..
Mera rom rom kyun jala..
Hum the dewane.. tere dewane..! RK removes her hand n says.. searching for answer… as well .. ! He is about to say .. ‘Main tumse.. ‘ (I …) but stops n leaves n Madhu breaks down! Madhu again goes to check at Romas room n RK comes n says..he isnt a poster of film that is changed every Friday n Madhu says..she isnt a thing he bought that he keeps showing off the price tag.. to all to say.. he bought her! Madhu turns n sees Sultan ..
Sultan asks Madhu if she will take care of Aryan after him? Madhu is shocked and asks him, why are you talking like this? What’s going to happen to you? and where are you going? Sultan says, I live a dangerous life.. a bullet is always after me.. till now destiny is in my favor.. but day when I have an argument with destiny, destiny will move away from between me and bullet.. and your promise is very important for that day. He forwards his hand to Madhu and Madhu only stares at him. 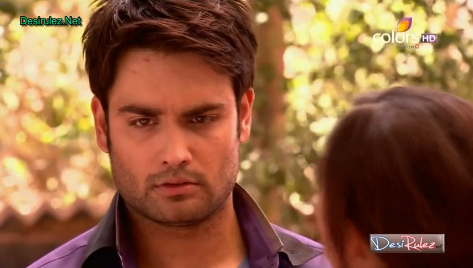 Precap — Dips tells RK.. they are both same.. Dagabaz .. RK says.. if her love was true..she wouldnt have cheated him .. ! Dips says.. if his so called love for Madhu was true.. he wouldnt have cheated her..! Sultan asks Madhu for a favour.. to take care of Aryan after him! He extends his hand towards Madhu ..! Madhu is shocked ..but puts her hand in Sultans n promises..that she will ..! Sultan asks Madhu if she wants to meet Aryan..but he is asleep! Madhu says..she does not know how to say Alvida.. she has never said Alvida..only heard..! Sultan turns to leave.. Madhu calls back and says that the number of times she has saved Sultans life.. it was all lifes doing.. giving him a second chance.! She tells him to reconsider and try to live life..once more..before life gets tired giving him upteem chances..! Sultans waks off..! Madhu watches..! She then looks at RKs poster and recollects how he put color all over her..! She feels his touch on her face..! She rushes upstairs..to her room! At the mansion, RK walks in a huff..! Radha calls out..to him and asks the matter? RK says that he is sorry for shouting on her a while back! He says he cant talk to Radha right now as things are worse than before! He asks her to leave him alone.. n walks towards his room! Radha is sad…! RK finds Dips in his room sitting pretty on his sofa..! She spots him while making a drink! She says.. heard he was in chawl. .thought he needed support.. drinks as well as her! RK asks if she came here to be humiliated again? Dips says..he too went to get humilliated..! She says.. purani buri adatein aur purane ashiq.. chudaye nahi chut-te..! Dips says..if he is feeling bad..she will leave..! RK asks her to sit put.. n asks if she likes it neat? Dips says..he knows how she likes it..! RK asks Dips why she comes every time to him? Dips asks him ..why he keeps going to chawl to get Madhu back all the time..? RK says..he asked first..! Dips says.. what to answer.. he is the scent for whom she comes ..! Dips tries to hug him n says.. has he ever noticed..how similar they are? RK says..she isnt that stoned to say.. they are similar..! Dips says.. no matter if he accepts or not..they are both same.. both are Dagabaz..! RK says..there is adifference.. if her love would be true.. she wouldnt cheat on him..! Dips says..strange..seem he has not seen the mirror. .else if he sees it would say..if RK had so called loved Madhu truly .. he wouldnt have cheated her..! Dips says.. the mirror told her…she n RK are just the same..! RK asks her to leave..! Dips says.. so angry he is.. just liek a kid..! Dips tries to finish her drink but RK takes her glass n drinks n says.. its done.. OUT! Sultan is driving at full speed on the roads ..! He can hear voice.. of a lady saying drive slowly ..n then screaming..! He can hear Madhus voice asking him to try to live life once more..! HE drives the car off the road n pulls hte brakes..! He recollects Madhu putting color on his face.. tasting Aryans prasad before letting him eat .. putting gun on her head ..n facing him bravely.. the first meeting in jungle with Madhu..! Sultan returns home and Kaka is surprised to see him..! He says.. glad to see him back so early.. did he forget something? Sultan says. .no ..rather remembered something..! He watches Aryan sleeping in the sofa and carries him inside to his room..! HE asks Kaka if Aryan ate? Kaka says..Aryan was upset abuot not being able to meet Madhu.. but if they hd woken him..he wont have been able to leave Madhu n come..! Kaka asks Sultan to sleep n he sleeps by Aryans side..! Kaka smiles happily..! Sultan asks to switch off light..n holds Aryan ..! Next day morning.. Bittu ji comes to call RK n asks if he will go to shoot? RK asks Bittu what is his age? And if his ears are working.. then why is he shouting? Bittu says fine.! RK stretches his hand on Madhus side of the bed n recollects the moment when she was here ..! BG- Woh lamhe! RK is combing his hair and remembers Madhu combing her hair..! He slams the comb down..! He takes out his shirt and remembers Madhu helping him to put his shirt on..! He huffs and looks at the sofa n remembers Madhu feeding him when he was shot..! He remembers chasing Madhu around the room and then packing her in hte suitcase.. n fumes ! He watches their pic on the wall n how Madhu had tripped while putting it on..! He walks out of his room and comes to the hall and remembers how Madhu had reminded him to call her Biwi..! RK calls out to Bittu..! RK says shotting cancelled.. pack up..! Bittu says.. he says that on shoot n RK says. he wants to do something different n if he has a problem.. he will do Bittus pack up too! Madhu is walking to her room when Paddo asks the matter n Madhu says..shooting got cancelled .. RK cancelled..! Paddo says..good thing Trish has returned after long so they can all relax..! She says..that chawl ppl are going to shirdi so they can go there..! Madhu agres! Aryan tells Sultan that the holi red color is still on his face n says.. Madhu had put right? Sultan smiles..! Aryan says..that its permanent color..wont go off.. will it stay forever? Aryan giggles n Sultan asks him to focus on studies.. n walks from there! Aryan picks up the codless phone n connects Madhus number n gives to Sultan saying ur call ..! Madhu receives n says HELLO .. Aryan? n Sultan says.. Madhu? Madhu is confused n Sultan feels shy ..! Both are silent on phone..! Precap — RK is on the set and pulls Madhu around ..! HE shows her the telephone booth n then shows Madhu the swing n says.. do u remember.. karwachauth swing? Karwachauth RK style! He slow dances with Madhu…! BG- Tu hai sirf meri .. phir bhi na jane..mujhko ye tu bata.. duriya hai kyun darmiya..! Madhu closes her eyes n RK-Madhu are closing in for a kiss!